“Fashion dies very young, so you must forgive it everything,” said Jean Cocteau the French poet, playwright, designer, filmmaker. It’s a long-lasting insight about fashion’s usually temporary triumphs and trials as nothing really lasts. 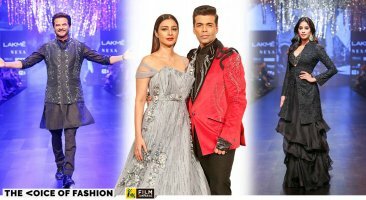 So, will this “trend” of bridal and wedding excess played out in real life by five of Hindi cinema’s most popular actors—Ranveer Singh included as an extraordinary case study in dandy culture—go “out” as all fashion must? Or will it mean igniting 365 more Instagram handles that show otherwise nice-looking human beings whose outer selves have been painstakingly disguised with every part of their body adorned, tattooed, flowered, painted, decorated and splayed by colour? Will red remain the most “trendy” bridal colour—red as in Anushka Sharma’s bridal Banarasi sari, red as in Sonam Kapoor Ahuja’s bridal anarkali, red as in Deepika Padukone’s chooda and sindoor, red as in Priyanka Chopra Jonas’ wedding lehnga? Will plus-size jewellery be the stand-out tool to announce “tradition”? More crucially: Will the pressure of “getting married lavishly and listing all that you wore and the parties you threw” ease out or only intensify? Can bystanders like us walk into local markets in our cities without being aggressively hawked to look at bridalwear, as if everything else that we do to exist and survive is irrelevant? More simply put: Can I have a bonafide Indian existence if I don’t own choking chokers and redolent lehngas? (Left) Sonam Kapoor in a red anarkali lehnga by Anuradha Vakil, on her wedding day. 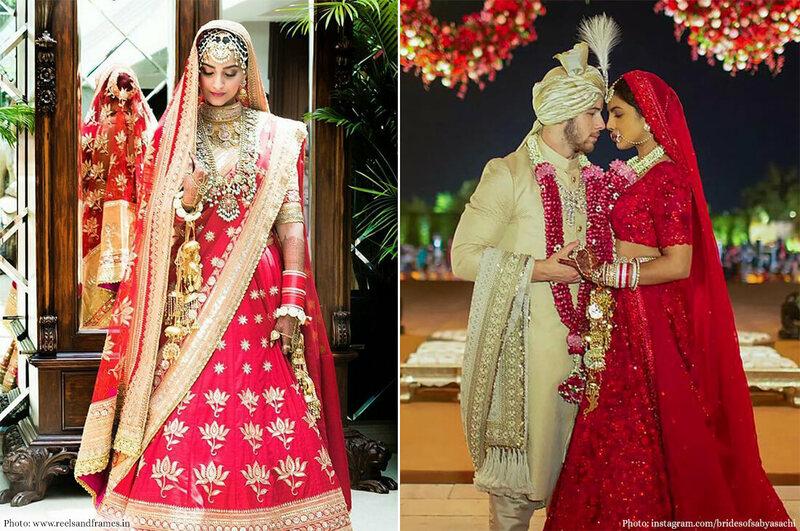 (Right) Priyanka Chopra in a red ghaghra choli and jewellery with husband Nick Jonas, both wearing Sabyasachi on their wedding day. Here is how it may unpack: this excess, as outrageous as it is complex has in fact, done us a service as a culture. 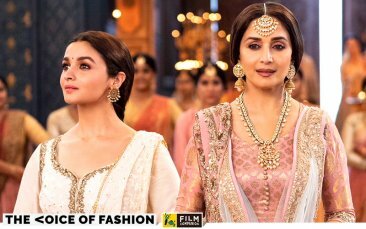 Thanks to Anushka, Deepika, Sonam, Priyanka and Ranveer for exhausting us and thus propelling our senses to explore other aspects of Indian-ness. Guided by the swinging pendulum notion of how attention and focus psychologically shift away from a point after you are hit by an overdose, this visual assault of much too much, will take us elsewhere. The reason behind focusing this story on Hindi cinema celebs is that by all evidence India is perpetually obsessed with “Bollywood”. 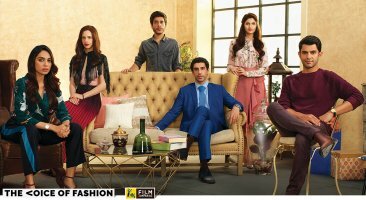 We are lured into health, spending, savings, holidays and parenting through them—chocolates and chyawanprash (Amitabh Bachchan for Cadbury and Dabur among multiple other endorsements), banking (Anushka Sharma for Standard Chartered), makeup and glamour (Deepika Padukone, Sonam Kapoor Ahuja for L’Oréal), dating apps (Priyanka Chopra Jonas for Bumble), Swiss Tourism (Ranveer Singh) and parenting of baby celebs (Taimur Ali Khan). They have decimated fashion models and fast cars. A showstopper’s contract with a luxury car sponsor necessitates them getting photographed next to it for instance. They have turned jewellery houses into comic shows—where the biggest necklace wins the best prize. They have drained fashion magazines of new, irreverent ideas making them altars of celeb worship. We love, follow and fan them. So their lives must template the ones we aspire for. 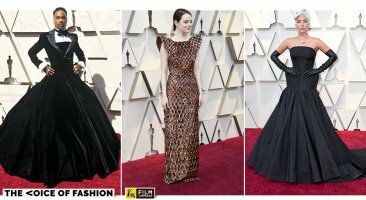 The skewed power relationship between the fashion industry and filmstars is there for all to see—the stylists dictate and (many) designers listen. And then start “designing” for stars instead of the larger customer base, sometimes losing sight of their own design goals for profitability. We are willing converts to celebrity culture; let’s not blame Ms Chopra Jonas, Ms Kapoor Ahuja or Mr Bhavnani for it. Hopefully, an interval is coming up in this obsession. So here is a risky prediction. 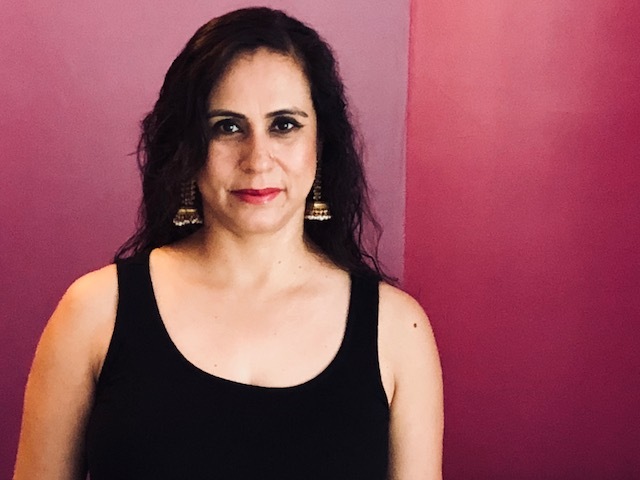 2019 will urge us to explore a lot else in Indian culture—that has more to do with the cultural vibrancy of India. Our fashion, food, locales and rituals, not just in weddings. This is not to advocate or prophesize 2019 as a year of absolute or austere minimalism. But it will certainly be the start of a phase of less noisy fanfare and proportional celebrations. Moderate Minimalism. Or Moderate Maximalism. Mod-Min and Mod-Max. Minimalism also means austerity or asceticism but here it is about the shifting and balancing of aesthetic. 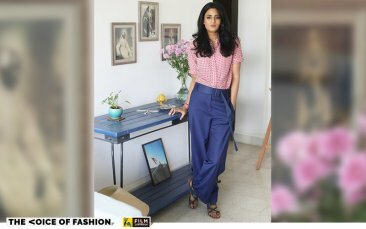 An exploration of less embellished garments, non-palatial wedding venues, non-fairy tale narratives in our Instagram stories, simple, delicious meals, walls that don’t need three splashes of colour to be called “Indian”, art that is hung in the bedroom instead of a gallery-like drawing room, the joy of wooden toys, the play of light in diaphanous, unembroidered chanderi, the stunning power of a plain silk Kanjeevaram sari, furniture that doesn’t need to wear brocade to look “traditional”, invoking admiration for delicate, oh-my-god fine needle embroidery on a rare Pashmina made by an artisan in ravaged Kashmir. Mod-Min may mean, who knows, rejecting the ubiquitous gold choli for a plain one in almond-coloured Ponduru khadi. It could be finding the spine of feminism in saying what you mean and meaning what you say instead of sending out contradictory impulses. Mod-Min could mean a fashion designer finding purpose in sending the Kerala Kasavu sari to Cannes this year. That is the symbolic women’s rights-textile statement-Sabarimala saga-Kerala floods-white-is-right story of our times. Mod-Min could mean the next Bollywood wedding to host a reception for kids of Dharavi theatre. It could mean rejecting twinning outfits that celeb couples now wear and finding individual resonances outside the hold of the “stylist mafia”. Mod-Min is liberation from the slavery of following filmstars. 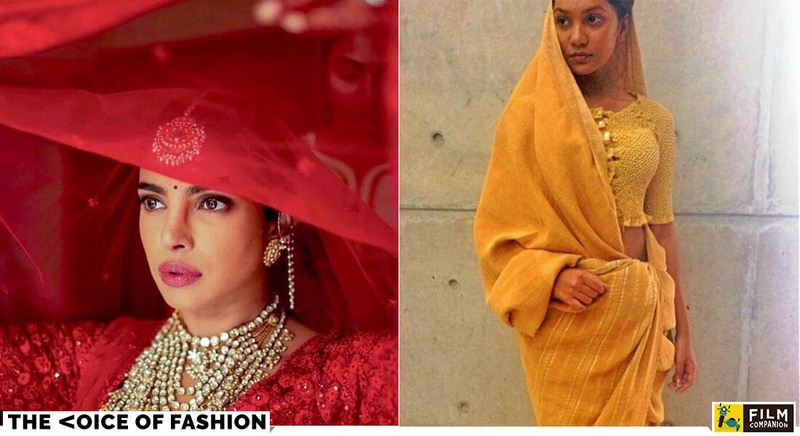 Mod-Min doesn’t mean wearing a Khadi Gramodyog sari instead of a Sabyasachi as your bridal wear. 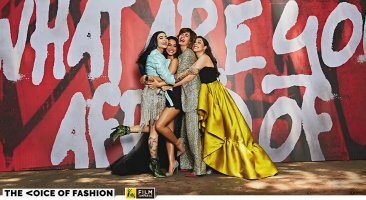 Mod-Max will not mean having a demonic fight with your parents or in your head about whether to wear Abu-Sandeep or Manish Malhotra but perhaps about meeting a Kanjeevaram weaver in person and asking for a signature sari woven in the colour you want. Minimalistic is not just about being pared down and drab. It is about digging aesthetic options that exist in our culture but are situated outside the red-gold-big and audacious as favoured by the film star. Mod-Min may also mean returning to basics instead of just roots. And not using “tradition” as a word or notion to get away with just any interpretation of it. As hundreds of visitors to Bridal Designer of 2018—Sabyasachi Mukherjee’s Instagram page wrote to him, tradition in India is not synonymous with embellished bridal lehngas or jewellery that competes with a bride’s weight. Tradition signals some rituals, the texture of materials used for weddings or other milestones in our lives, it has a point of view on colours and specificities in ornamentation and ceremony. But it does not define proportion. Muchness, bigness, proportion is a choice a person or a group of persons make. 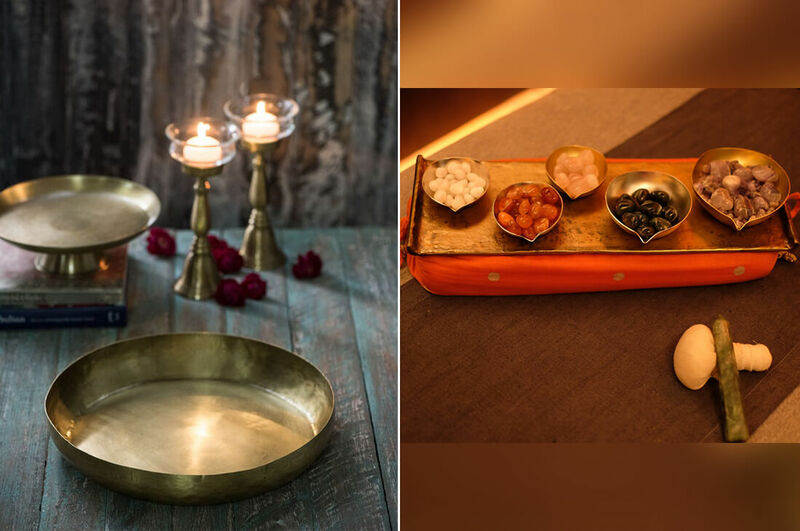 Indian traditions of mehndi, haldi, house warming, funeral rites, arrivals and departures of people and phases in our lives are not dictated by size, they are dictated by a “certain aesthetic”. What else does that “certain aesthetic” mean? This will be the year to discover that. How intriguing that the Bollywood elite became the madding crowd in 2018. Their sameness or their reluctance to be different, their choice to do nothing, say nothing, wear nothing that spelt sustainability—the gurgling and currently the richest idea in fashion and living—has made them oddly a part of the herd, instead of leaders and “changemakers” that conferences idolise them as. Change making cloth of the year? The handwoven, humble, cotton gamoosa (gamcha) of Assam that 18-year-old Hima Das held up in a maximalist victory for India this year. This was her flag after her win in the 400-m event at the IAAF World U-20 Athletics Championships at Tampere in Finland, July 2018. Superlative Mod-Min. And the losing maximalist? Shredded jeans, some so shredded (loved by our celebs of course as they are trendy) that knees gape out. In a country of poor, shelter-less millions who are clothed in such tatters for their entire lives, let’s please vote out shredded and torn jeans from our wardrobes.